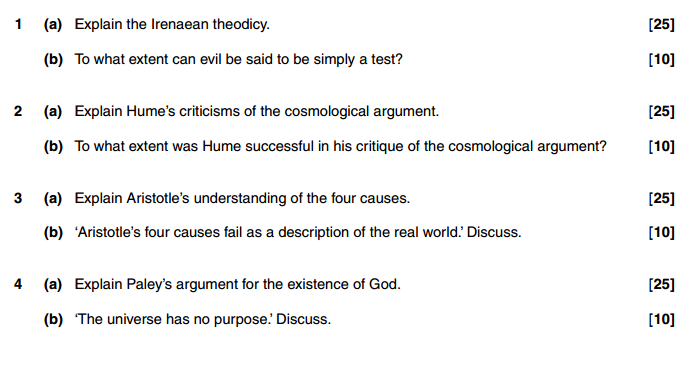 (b) On what grounds might Plato’s understanding of human reason be criticised? Answer one question from this part. 2 (a) Explain Durkheim’s and Weber’s understanding of the nature and role of religion in society. 1 ‘The concept of resurrection of the body is incoherent.’ Discuss. 2 ‘By definition, a miracle can never happen.’ Discuss. 3 ‘Philosophers have proved conclusively that religious language is meaningful.’ Discuss. 4 ‘God is most clearly revealed to humanity through scripture.’ Discuss. 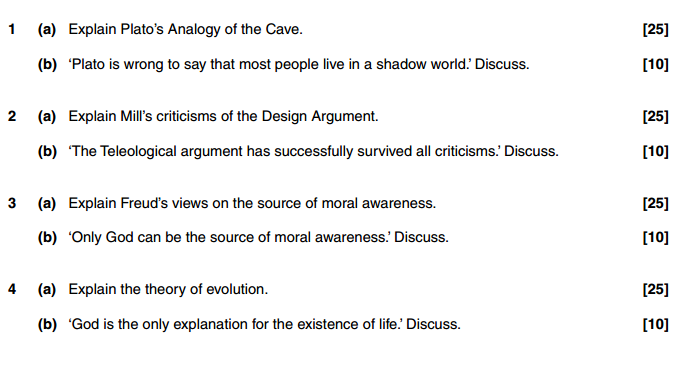 1 ‘The concept of disembodied existence is coherent.’ Discuss. 2 Assess the view that the different forms of religious experience are nothing more than fantasy. 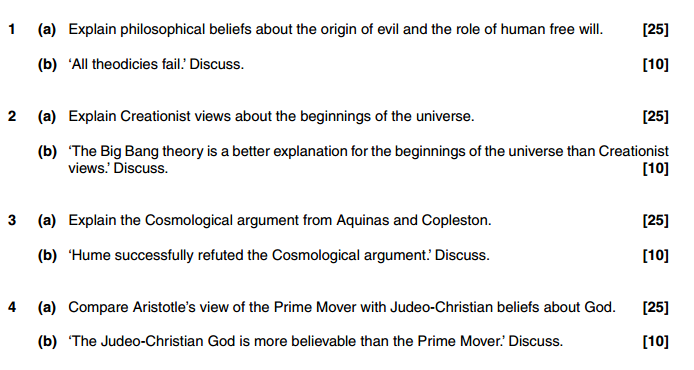 3 ‘The falsification principle offers no real challenge to religious belief.’ Discuss. 4 ‘Scripture is the word of God.’ Discuss. 1 ‘The concept of Hell makes no sense.’ Discuss. 2 ‘The best way to God is through religious experience.’ Discuss. 3 Assess the view that miracles are an obstacle to faith. 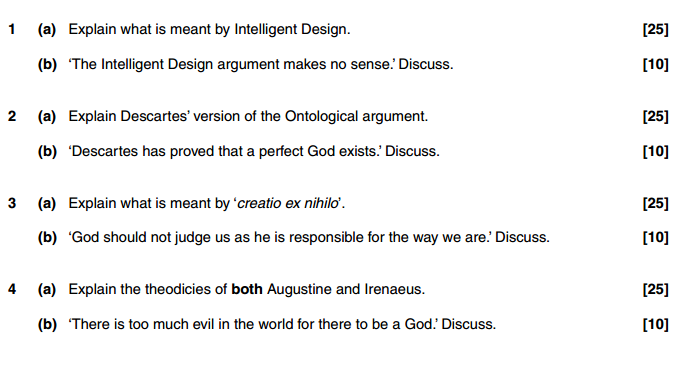 4 Consider whether symbol provides any clear understanding of God. 1 To what extent can God be held responsible for moral evil? 2 ‘Religious language and ethical language are both about facts.’ Discuss. 3 ‘The only point in behaving morally is to be rewarded after death.’ Discuss. 1 ‘Ethics are the product of society, not of religion.’ Discuss. 2 ‘Evil exists because humans have free will.’ Discuss. 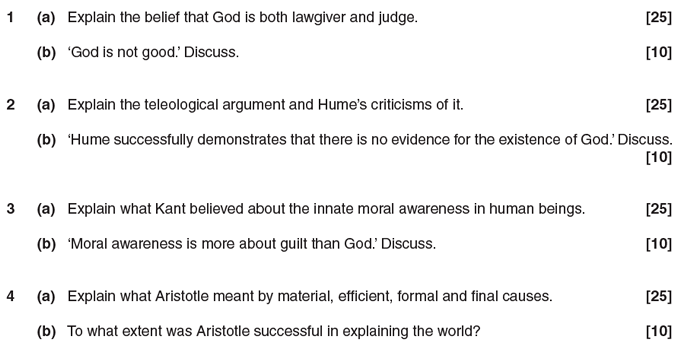 3 ‘The fact that we have a conscience proves that God exists.’ Discuss. 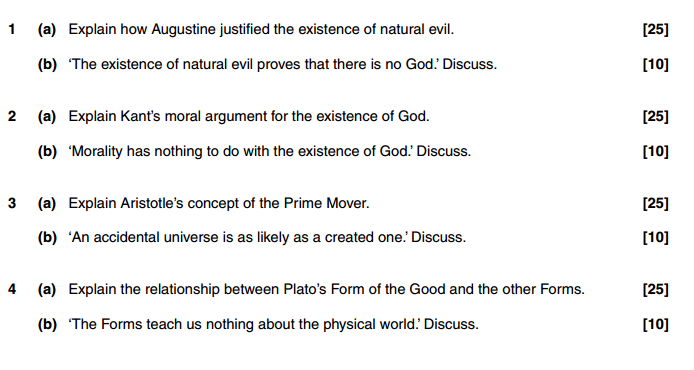 1 ‘Ethics come from the human mind; not from God.’ Discuss. 2 ‘Ethical language is no more meaningful than religious language.’ Discuss. 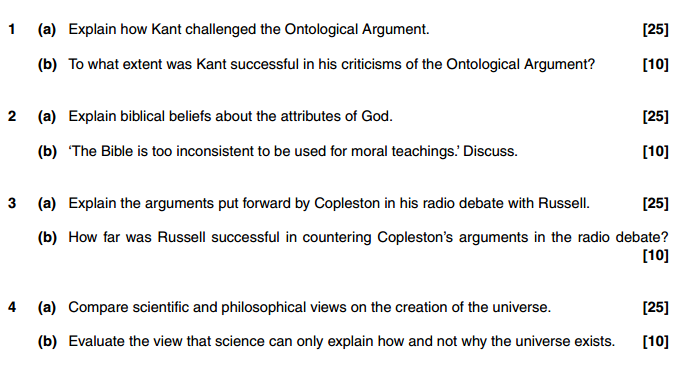 3 ‘God is omniscient so therefore we cannot have free will.’ Discuss.